Rajuk authorities evicted illegal structures by the side of the road at Kazipara area at Mirpur on Wednesday. 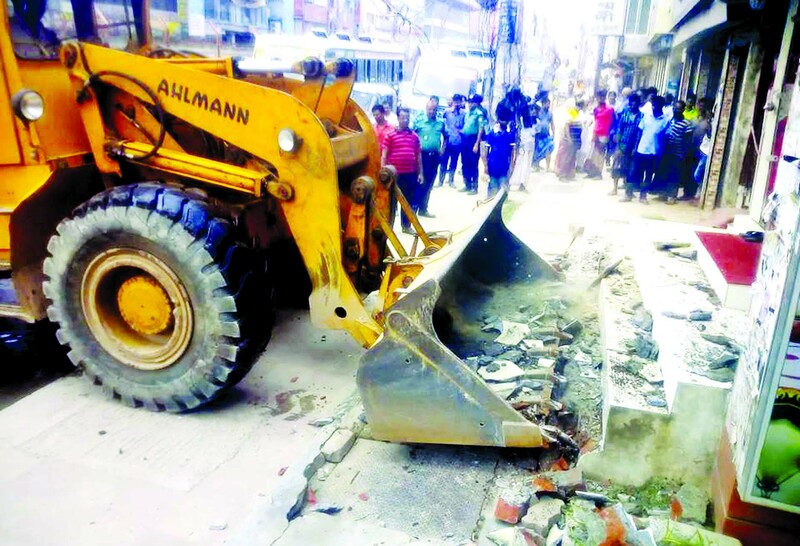 In a drive against unauthorised structures at Rokeya Sarani and Kazipara of Mirpur in the capital on Wednesday, Rajdhani Unnayan Kartripakkha (Rajuk) fined Tk 50 lakh to 19 buildings and business establishments. A Rajuk Taskforce, led by its executive magistrate Jesmin Akhtar and authorised officer of Zone-3 Md Mubarak Hossain, conducted the drive at 26 holdings. Of them, the owners of 19 buildings and business establishments were fined for using residential buildings and parking lots on commercial purposes. Akhtar Furnishers Tk 2 lakh, Luxury Furniture Tk 1 lakh, Sawdagar Furniture Tk 1 lakh, Oriental Furniture Tk 1 lakh, TVS Motorcycle showroom Tk 2 lakh and Honda Motorcycle showroom Tk 1 lakh. Rajuk assistant authorised officers Ranjan Mandal and Md Ilias Mia and members of law enforcement and services agencies assisted the drive.